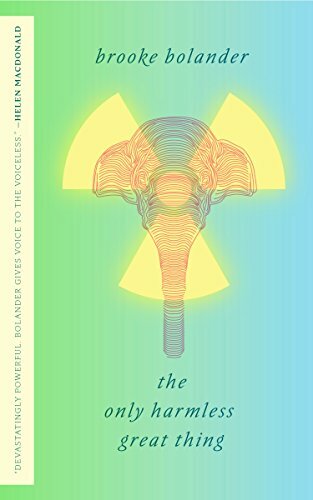 This month's Tor Book of the month club selection is THE ONLY HARMLESS GREAT THING by Brooke Bolander. Not the kind of book I usually read, but I think I will anyway. You can grab it at ebookclub.tor.com for free until Jan 19th. Some bookstores call it a novelette and I agree as it is only 96 pages. But certainly long enough to have some serious meat in it. I know of both events in history quite well. The Radium Girls were factory workers that painted dials on wrist watches with Radium (a radioactive material), to them glow in the dark. Heck, they were TOLD to use their mouth to get the fine tip needed to paint the numbers on the dials. At the time this was the only way to get the numbers to glow in the dark. Why no one thought this was dangerous is beyond me. I guess they figured it was not enough to be toxic. Although the owners and scientists wore lead protection and tongs when working with the stuff. Perhaps the exposure wearing one of these wrist watches would have been very low (not low enough for me that is for sure), making hundreds a day and pointing the brush with your mouth to do the job increases the exposure a million times. As for the elephant, I know of another odd execution which was done by a crane and hung the elephant in question. People for many miles showed up to see this execution. It also boggles my mind why so many people would want to come to see such a gruesome display. Of course we have horror movies that pale by comparison, but they are fake. This was going to see an actual elephant killed. Granted, she killed her trainer and she couldn't be trusted again (although he was unqualified to be a trainer in the first place making his death questionable and may not have been all her fault). However, they hung her to "put on a show". Putting her down is one thing and I agree it was probably necessary, but the method is inhuman. It caused her great suffering as it didn't work well and the crane even had difficulty lifting the elephant. Why they thought this was a good idea boggles the mind.